The Self-Made Wardrobe is a project where I only wear garments I’ve made. It’s sort of a year long experiment in getting dressed without clothing labels. I can never quite figure out how I feel about tights with ballet flats. Some days I think they look fine and keep your legs warm. Some days I think that the combination – especially when the tights and the shoes are the same color – make my feet look oddly long… And yet, in this picture I think my feet look kind of short… I guess feet are just a little weird. I spent the day at a spindling demonstration/talk at Gauge & Tension (a popup yarn shop in Greenpoint) and would have much preferred to be wearing an easy button up over my boring black sweater – instead of the deconstructed black sweater – because it would have given me more range of arm motion. *Archer is the name of a basic button up shirt pattern, put out by Grainline Studios. It turns out that the Perfect Transitional Weather Cardigan, is also the Perfect Sit-At-Home-On-Your-Couch-Knitting-Your-Winter-Coat Cardigan. I don’t love how this outfit looks, but it was a day of sitting at the computer writing, and these clothes were cozy & comfortable, so I went with it. 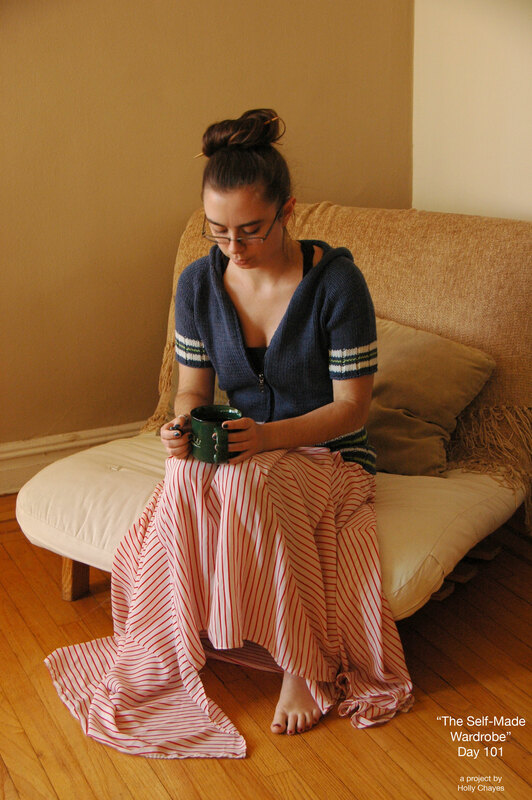 I really love this sweater and skirt combination, but it was so warm I ended up taking off the Moonstruck Cardigan, and just wearing my Boring Black Sweater, which was much more boring to knit than it is to wear. It was 60 degrees (fahrenheit) in the middle of November. WTH?! So I went back to my default blacks, and I realized a desperately want another black maxi skirt – they’re just so easy to wear! I took my winter coat out for an experiment yesterday. It was chilly enough to need it, but not cold enough to be a terrible mistake. I’m super glad to say it worked! I only wore a light sweater under it, plus my blue kimono, and I was quite warm, but I definitely want to add a front zipper, and pockets. I wore the blue kimono over the sweater and under the coat to help keep the alpaca fuzz off all my other clothes – which also worked. The Self-Made Wardrobe Week 14 – a new sweater! Congrats on making it to day 100 (and beyond!) I think I’m going to join you guys in the Archer sew along. I’ve been terrible about sewing lately and I need a push! I love the way your gingham skirt outfit looked! Thanks Alicia! I love that everyone has a different reaction to every outfit! Something I feel “eh” about, someone else is sure to love, and vise versa.